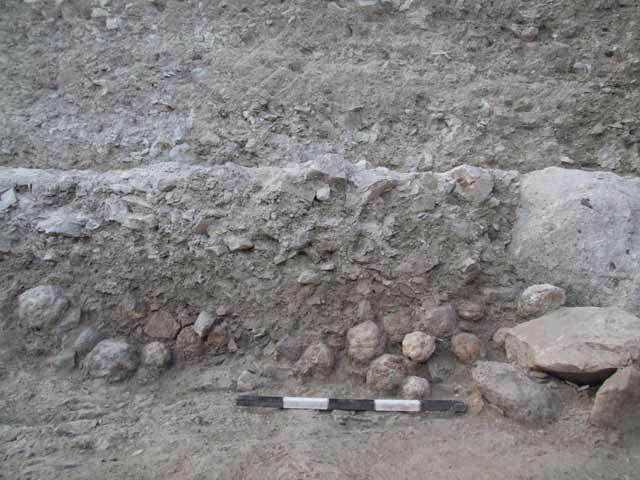 During July-August 2008 a trial excavation was conducted at the top of the northern slope of Tel Gush Halav (Permit No. A-5471; map ref. 241874/770330) after master plan of Jish village was enlarged. The excavation, undertaken on behalf of the Israel Antiquities Authority and underwritten by the property owner, was directed by M. Hartal (photography), with participation from Y. Yaakobi and Y. Lavan (administration), R, Mishayev (surveying) and A. Shapiro (geological consultation). 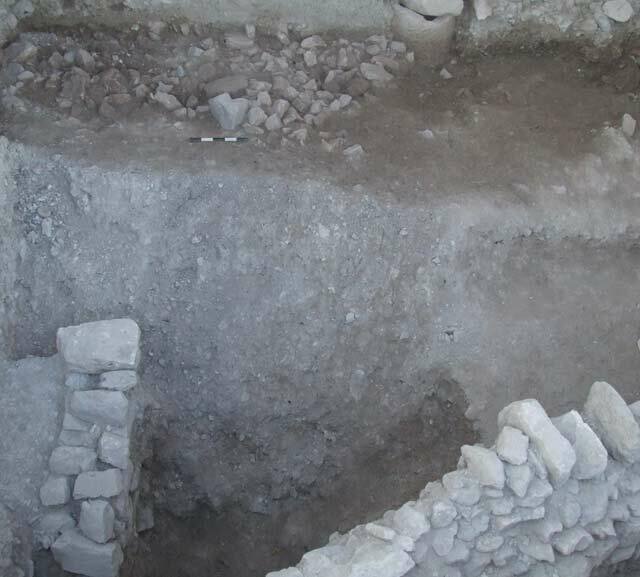 The excavation was meant to re-evaluate the finds in Area D of an excavation that was conducted there in 2004 (HA 122) and to analyze the nature of the finds in the wake of an appeal against the decision by the Israel Antiquities Authority prohibiting construction there. 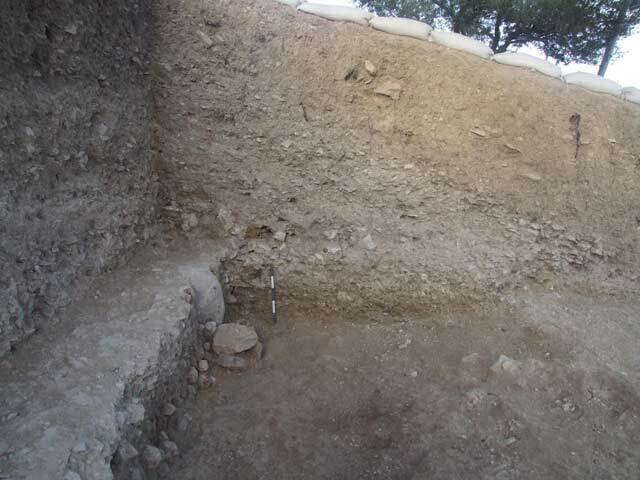 The excavation area (7×7 m, depth 5 m) is located at the top of a steep slope covered with soil, in a grove of olive and fig trees. 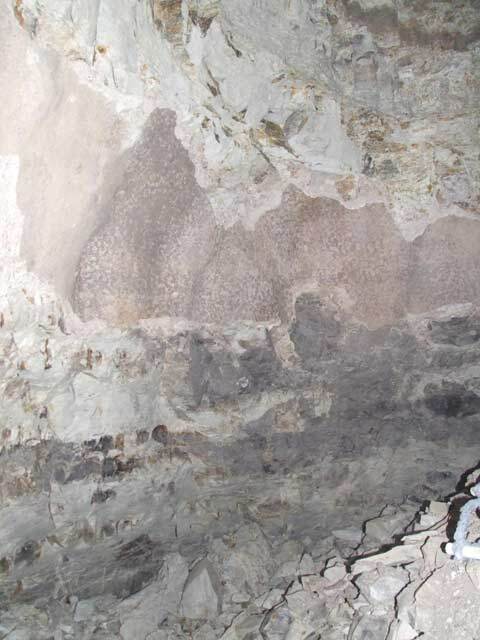 Six strata were exposed in the excavation, which reached the level of the bedrock; they are described below from the earliest layer to the latest. Stratum 6. The bedrock of the hill on which the tell is built is composed of layers of chalk with layers of clay in between. The surface of the bedrock is fractured but horizontal at the top of the hill whence it drops off in a terraced slope. 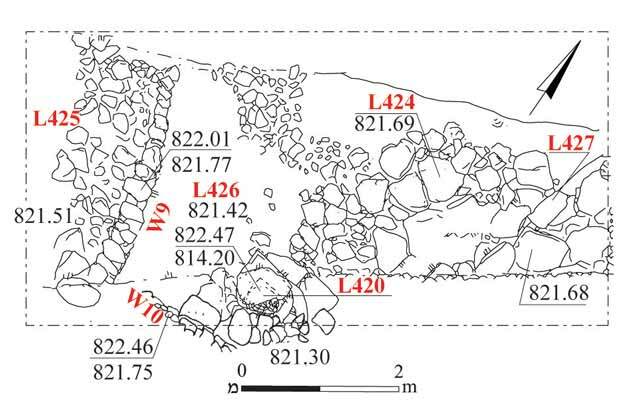 Two bedrock terraces separated by 1.5 m in elevation were exposed on which there are rock-hewn installations and finds that are ascribed to the Hellenistic period (Fig. 1). 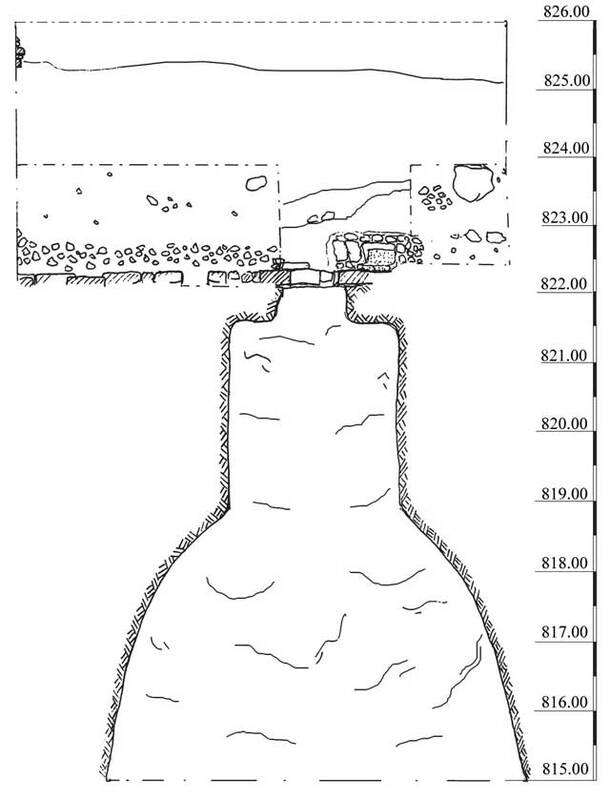 A cistern (depth 7.4 m; Fig. 2) was hewn in the upper terrace. The cistern’s capstone consisted of a stone unit with a rectangular base (0.40×0.78×1.00) and an upper part shaped like a vertical pipe (inner dimensions: height 0.6 m, upper diameter 0.36 m, lower diameter 0.49 m; Figs. 3, 4). A square groove meant to accommodate a lid was hewn in the top of the pipe. Wear marks from the ropes used to draw water were observed along the edges of the pipe, evidence of prolonged use of the cistern (Fig. 5). 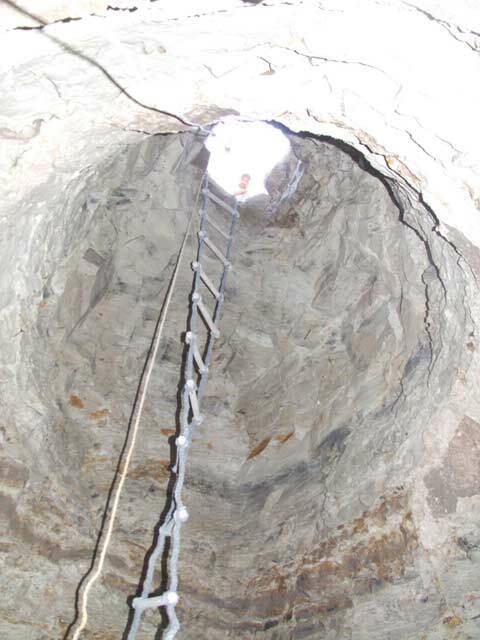 A vertical shaft (diameter 2.5 m; Fig. 6) was hewn in the upper part of the cistern (c. upper 3.5 m), whereas the bottom part became wider and bell-shaped (diameter at the bottom 6.1 m). The sides and floor of the cistern were treated with coarse thick plaster (Fig. 7). On the bottom of the cistern was an accumulation that reached a maximum high of 2 m at its center, and contained rubble and bits of plaster that had fallen from the walls. 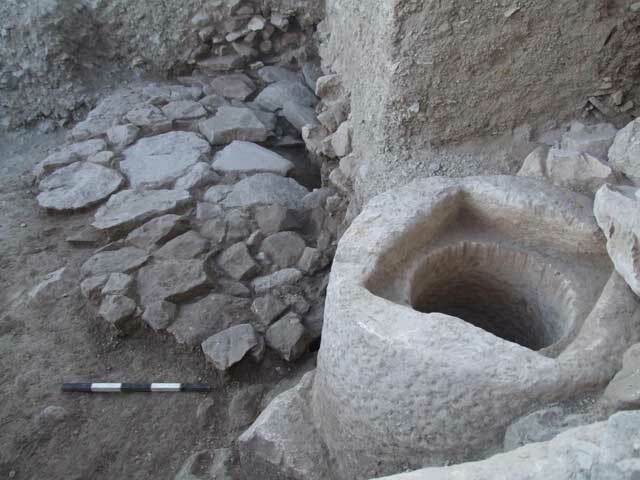 Because of the safety hazard the inside of the cistern was not properly excavated but an examination of a small area revealed that no sediment or clay accumulated in it from the water, and no pottery sherds were found in it. Therefore, the cistern was most likely cleaned shortly before they stopped using it. The continuation of the upper bedrock terrace alongside the cistern was used as a floor after it was cleaned of earlier accumulations; five Galilean Coarse Ware jar necks and a plain bowl (Fig. 8) were found on it. 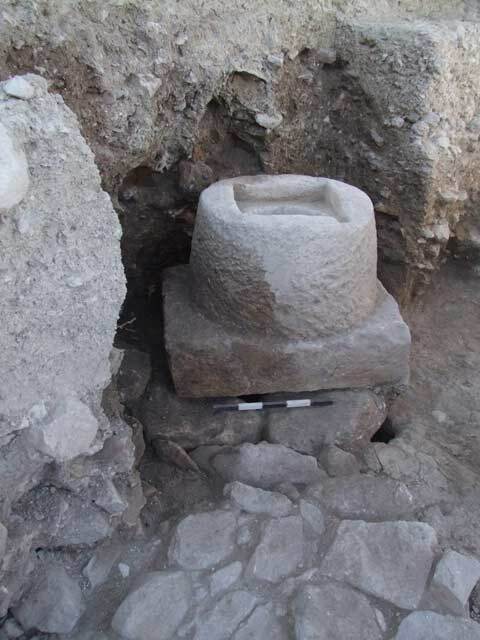 No other fragments of the jars were found; thus it seems that the necks were brought there specifically, perhaps to be used as stands for placing jars on while filling them with water from the cistern. These items date to the Hellenistic period and the hewing of the cistern is ascribed to this period as well. 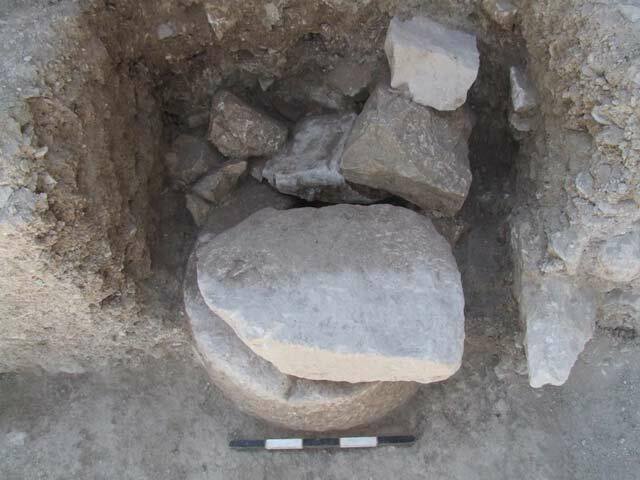 A layer of soil yielding a large quantity of pottery fragments from the Hellenistic period was revealed on the lower bedrock terrace. Stratum 5. Along with the continued use of the cistern during the Hellenistic period, a soil floor was deposited on top of the bedrock floor, covering the jar necks and negating their use. A flagstone floor (Fig. 9) was installed in the eastern part of the excavation area and to the north of the cistern’s opening; a channel was built in the eastern part of this floor which drained water used to fill the cistern. 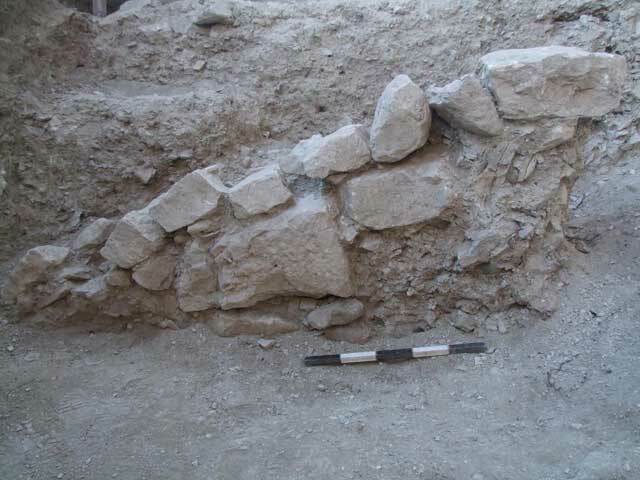 In the southern balk of the excavation was a section of a wall (10; Fig. 10), indicative of a building that extended south of the cistern. 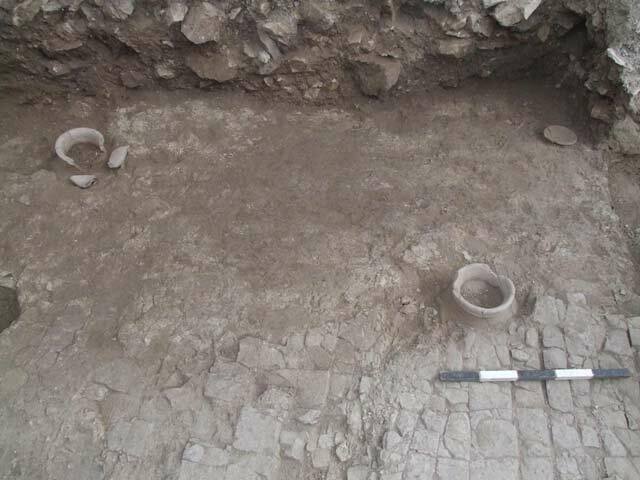 Next to it was an accumulation of soil with fragments of pottery vessels from the Hellenistic period. A similar accumulation, which rested on a layer of rubble, was found on the lower terrace. Stratum 4 (Fig. 10). In the Late Hellenistic period other changes were made in the area: the stone floor was covered with numerous pieces of chalk (L424, L427), possibly as a result of cleaning the cistern. 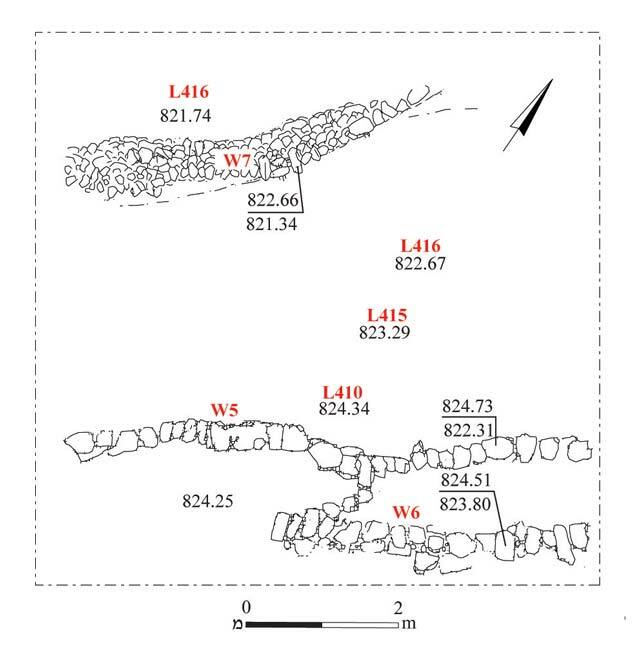 A similar layer of chalk fragments was found in the western part of the area (L425) delimited in the east by a neat row of stones (W9; Fig. 9) that was probably not a wall. Access to the cistern (L420) was now possible from the central area (L426) – between the two accumulations of chalk stones – which was covered with soil. Stratum 3. A glacis that was constructed as a foundation for the fortified rampart of the city in the Early Roman period, on the eve of the revolt against the Romans, is ascribed to this stratum. A flat stone was placed on the cistern opening (Figs. 9, 11) so as to prevent the cistern from filling up with earth. The bedrock terraces of the northern slope were covered with soil fill (maximum thickness 1.5 m; Fig. 12) mixed with fragments of chalk that formed the glacis – a steep uniform slope that made it difficult to climb to the top of the hill and prevented the enemy from reaching the city without detection. 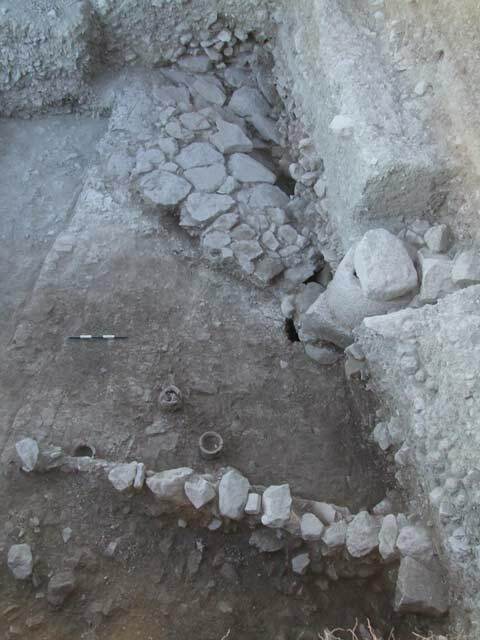 The ceramic artifacts that were found in the fill are ascribed to the end of the Hellenistic period and indicate a hiatus between this phase and the construction of the rampart itself (Stratum 2). A concentration of c. 250 different size geodes (‘Elijah watermelons’; Fig. 13) were found at the bottom of the glacis. These natural rock balls which have quartz crystals in their center originate in the Zivʽon River, c. four kilometers west of Gush Halav. It seems that the geodes were brought to the city to be used as a weapon against the Romans, and after they rolled down the slope were covered with the rampart’s layers of soil. A section of a wall built of roughly hewn stones (Figs. 12, 14) was exposed on the bottom terrace. The southern part of the wall was built like upside-down stairs and it seems that it was originally founded on the bedrock terraces. The wall was surrounded by material from the glacis or rampart that spilled around it; the wall was inclined to a great extent according to the gradient of the slope and did not connect to other walls. It therefore seems that it was built before the installation of the glacis but slid from its original place together with part of the glacis and rampart that was placed above it (below). Stratum 2. In this stratum a rampart was built over the glacis which was meant to raise the fortification significantly and thicken it. A thin layer of soil separated the glacis from the fill of the rampart. Like the glacis, the rampart was built of earth mixed with fragments of chalk, though one can see differences in the material that makes up its different sections. It was deposited on the precipitous slope of the glacis and was also very steep (maximum thickness c. 2 m; Fig. 15). Inside the rampart layer were numerous fragments of pottery vessels, some from the Middle Bronze Age and Iron Age, but most dating to the Hellenistic and Early Roman periods. It seems therefore that the soil and stones used to build the rampart – and spilled from the top of the tell onto the slope – were taken from the area of the settlement atop the mound. Fragments of Galilean Coarse Ware and Kefar Hananya Ware were prevalent among the vessels dating to the Early Roman period. Of the latter group only the types that date to the first century BCE and the first century CE were found. The ceramic finds are identical to those that M. Aviam discovered in excavations on the western slope of the tell (HA 84:11; 109:10-11) and show that the rampart was constructed in the first century CE. This confirms Aviam’s suggestion that the rampart was part of Gush Halav’s fortifications during the revolt against the Romans. Stratum 1. Two terrace walls (W5, W6; Figs. 16, 17), which were carelessly built of a single row of fieldstones and roughly hewn stones, extend above the rampart; similar walls were also found above the spill in an earlier excavation on the slope of the tell. A third wall (W7; height 1.32 m; Figs. 16, 18), also built of one row of fieldstones and leaning to its south, served as a kind of lining or terrace wall at the bottom of the rampart. A niche built of three flat stones was set in the wall and there were also two small elliptical niches in it that seem to have been used as footholds for climbing on the wall. 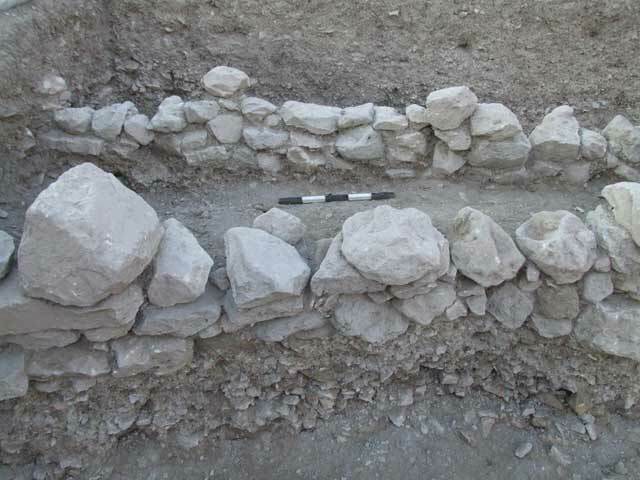 A thick accumulation of soil that conformed to the outline of the slope was on either side of Wall 5 and Wall 6 and also north of Wall 7; it seems the soil was adapted for cultivation after the rampart was no longer used. Fragments of pottery vessels were found in the soil, the latest of which date to the third and fourth centuries CE. It seems that the finds are insufficient for exactly dating the construction of the terrace walls because all of the soil on the slope contained similar ceramics; the only thing that can be determined is that they are later than the fourth century CE. The excavations finds have added to our knowledge from the previous excavations at the site and aid in reconstructing the history of the settlement on the tell. It seems that the first settlement was built there atop a residual hill that rose above its surroundings. 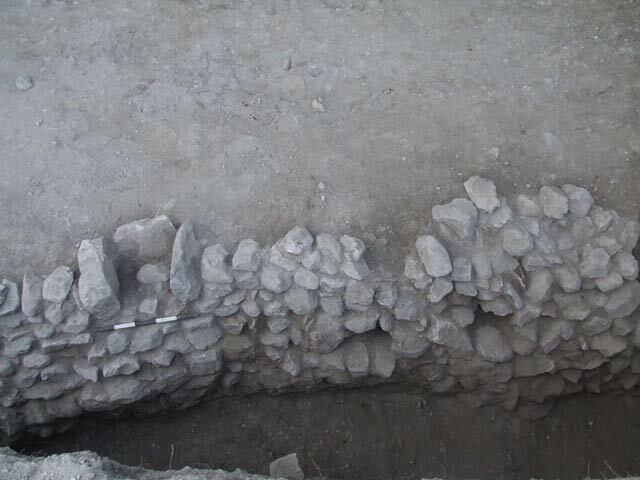 In an excavation on the southern slope of the tell (HA 120) habitation layers were found that date to the Middle Bronze Age and Iron Age, as well as the Early and Late Roman periods. 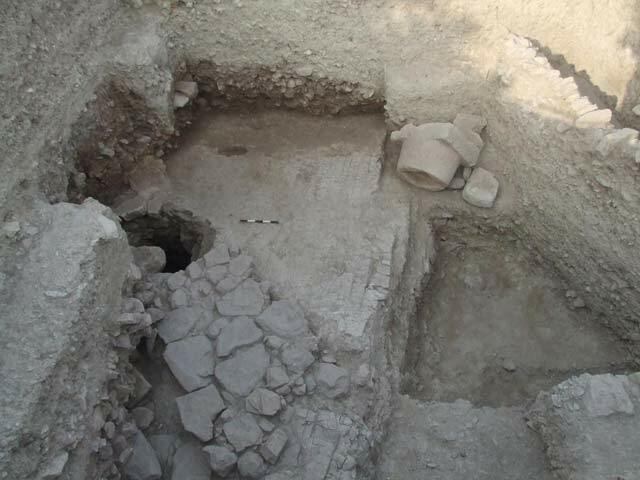 The excavation did not reach bedrock and therefore a layer dating to the Early Bronze Age was not exposed; pottery attributed to this period was found in the survey and in other excavations. The earliest finds that were exposed on the northern slope of the hill, which was steep and descended in tall bedrock terraces, date to the Hellenistic period. But it is possible that in the past there was also an earlier settlement here because the bedrock in Stratum 6 had been cleaned and the accumulations that were on it were apparently discarded onto the slope. The bedrock floor and the floors that were laid on top of it during the Hellenistic period (Strata 6-4) were used together with a large cistern that was hewn in the bedrock in this period. Josephus states that on the eve of the rebellion against the Romans, the settlement made preparations for being besieged and the fortifications there were paid for by Yohanan, the local leader. It seems that the fortification was constructed in two phases as evidenced by two layers of soil and stone fill that are distinguished from each other by their ceramic composition and separated by a thin layer of soil (Strata 3, 2). There are almost no contemporary parallels of fortifications that consist of ramparts, save the rampart that was exposed at Yodefat. It seems that the reason that this method of fortification was chosen at the site is because of the lack of appropriate stones for building and because the bedrock on which the settlement is built is cracked and unsuitable for construction. Although it is possible a city wall was built at the top of the rampart, the rampart negated the need for this and a low wall could have been erected atop it, thereby avoiding the cost of expensive building stones. Gush Halav capitulated to the Romans without a fight and therefore also continued to exist in the centuries to come during which the local inhabitants discarded refuse on the slope of the rampart. It seems that the nature of the bedrock, which contains impermeable clay that becomes slippery on contact with water, and the steep slope formed favorable conditions for repeated landslides from the side of the rampart, as evidenced by the location of a wall from Stratum 3 that slid together with a section of the rampart. This is also attested to by the finds from the excavation that was conducted on the northern slope (HA 122), where it was ascertained that the latest find on this slope is also ascribed to the third-fourth centuries CE. It therefore seems that the settlement on the tell was severely damaged in the fourth century CE, possibly by the earthquake of 363 CE. Since the finds from the Byzantine period were discovered only in the western and eastern parts of the village, it seems that in this period most of the settlement moved to the ruin at Nahal Gush Halav, where the lower synagogue is located. It was only during the Middle Ages that the settlement moved to its present location, but it was built on the southern slope of the hill and not at the top of the tell. 1. Stratum 6, the bedrock terraces and the opening of the cistern; in the foreground – a pavement from Stratum 5. Looking west. 3. The cistern capstone and the pavement from Stratum 5, looking west. 4. 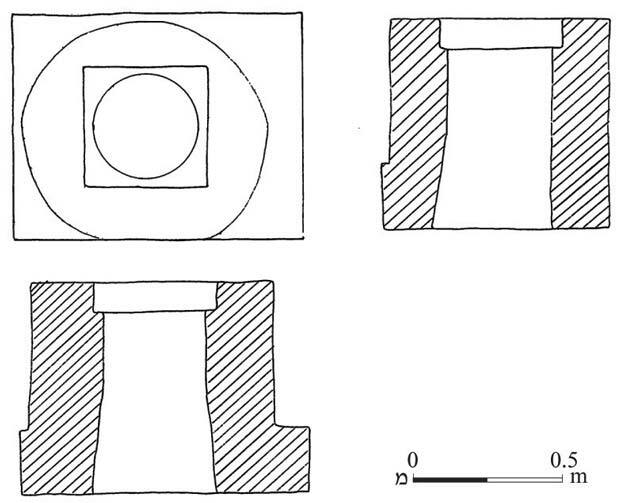 The cistern capstone, plan and sections. 5. The cistern capstone, looking east. 6. The vertical shaft in the upper part of the cistern, looking north. 7. Plaster on the side of the cistern, looking east. 8. Stratum 6, the jar necks and a bowl on the bedrock surface, looking west. 9. Stratum 5, an earthen floor and stone pavement next to the cistern; on the opening of the cistern – a stone slab from Stratum 3; in front – W9, looking east. 10. Strata 4, the upper terrace, plan. 11. Stratum 3, the stone that covers the opening of the cistern, looking south. 12. Stratum 3, the glacis fill. On the left – a wall that slid with the glacis. On the right – a wall from Stratum 1. Looking south. 13. Geodes at the bottom of the rampart, looking south. 14. A wall that slid with the glacis, looking east. 15. A trial trench in the rampart, looking west. 17. Stratum 1, terrace walls, looking south. 18. Wall 7, looking south.